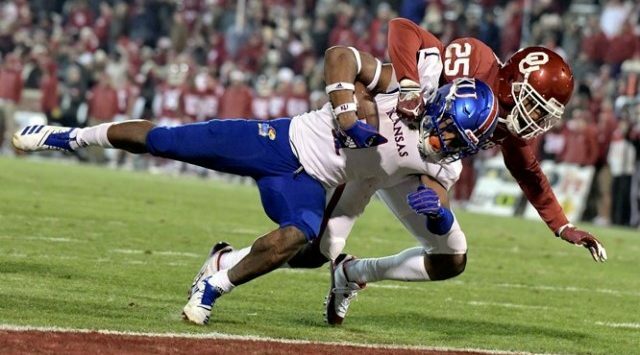 NORMAN, Okla. – Kansas freshman running back Pooka Williams Jr., rose to the occasion as the Jayhawks traveled to No. 6/6 Oklahoma, racking up 252 rushing yards and two touchdowns on the ground, while also adding a passing touchdown in the fourth quarter as KU fell to the Sooners, 55-40. On Oklahoma’s first march down the field, Kansas’ defense did what it does best – take the ball away. The Sooners entered the red zone, but not for long as junior safety Mike Lee forced his Big 12-leading third fumble and recovered it to give Kansas possession and kept OU off the scoreboard. Once KU got possession, Williams went to work and recorded his best performance in a first half of the season. Williams rushed for 72 yards in the opening quarter, including a 23-yard rush into the end zone, which gave the Jayhawks an early lead. The Jayhawks didn’t relinquish the lead to the Sooners until the nine minute mark of the second quarter. Despite trailing 21-10 at the half, the Jayhawks came out of the locker room with a spark on defense. Kansas opened the second half with an interception by senior cornerback Shakial Taylor, setting up a three-yard rushing touchdown by junior running back Khalil Herbert. Herbert’s score brought KU within four of the Sooners on its first drive of the second half. After KU came within a possession of the Sooners, Oklahoma charged ahead with back-to-back scores before the Jayhawks would strike again. Williams threw his first career touchdown to senior wide receiver Jeremiah Booker, giving Kansas’ offense a boost in the fourth quarter, but the potent Sooner offense was too much for the Jayhawks and gave Oklahoma the 15-point victory.